This is a baby shower favor that announces, "It's About Time" for the expectant mom to deliver! This unique gift is sizable, with a tailor-made presentation. 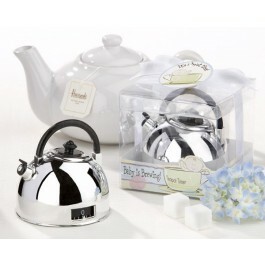 Designed as a shiny plastic tea kettle with a timer that twists at the bottom to countdown any interval of time from one to 60 minutes, this is a favor every guest will love! It's packaged in a clear top gift box showcasing the gift from all angles. 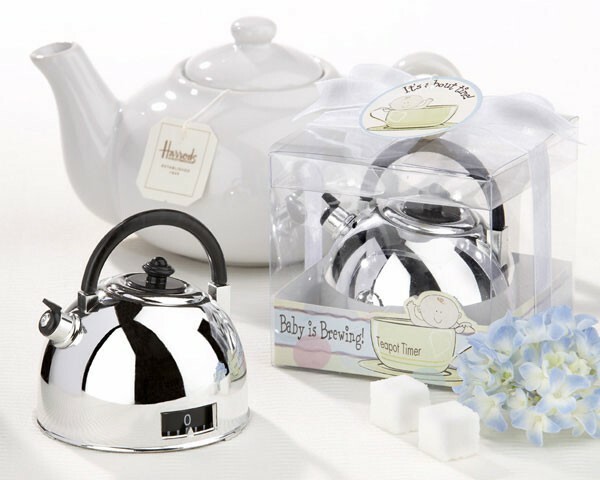 Bottom of box features cute graphic of baby in teacup with phrase "Baby is Brewing." Box is wrapped with sheer white organza ribbon with matching "It's About Time!" tag attached. Gift box measures 3 1/2" x 3 1/2".